Binocular disparity is an important cue for the human visual system to recognize spatial layout, both in reality and simulated virtual worlds. This paper introduces a perceptual model of disparity for computer graphics that is used to define a metric to compare a stereo image to an alternative stereo image and to estimate the magnitude of the perceived disparity change. Our model can be used to assess the effect of disparity to control the level of undesirable distortions or enhancements (introduced on purpose). A number of psycho-visual experiments are conducted to quantify the mutual effect of disparity magnitude and frequency to derive the model. Besides difference prediction, other applications include compression, and re-targeting. We also present novel applications in form of hybrid stereo images and backward-compatible stereo. The latter minimizes disparity in order to convey a stereo impression if special equipment is used but produces images that appear almost ordinary to the naked eye. The validity of our model and difference metric is again confirmed in a study. The paper (Adobe Acrobat PDF, 6.69 MB). The Supplement (Adobe Acrobat PDF, 0.8 MB). The final video (Windows Avi,Xvid, 108 MB). Talk (Power Point 2010, 15.2 MB). Fast Forward (Window Media Video, 11.5 MB). Please note: YouTube only gives a preview of the effect but doesn't reproduce it in professional quality. For full quality, please download the supplemental material .AVI video (108 MB). 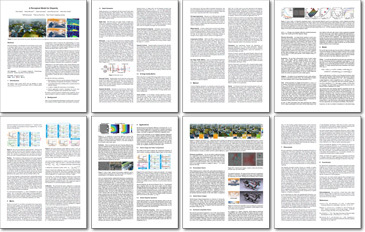 Press release: "TandemLaunch licenses new 3D technology"
Proceedings of Vision, Modeling and Visualization Workshop, 15-17 November 2010, Siegen, Germany. Proceedings of IS&T/SPIE Human Vision and Electronic Imaging, 2012, Burlingame, CA, 22-26 January.